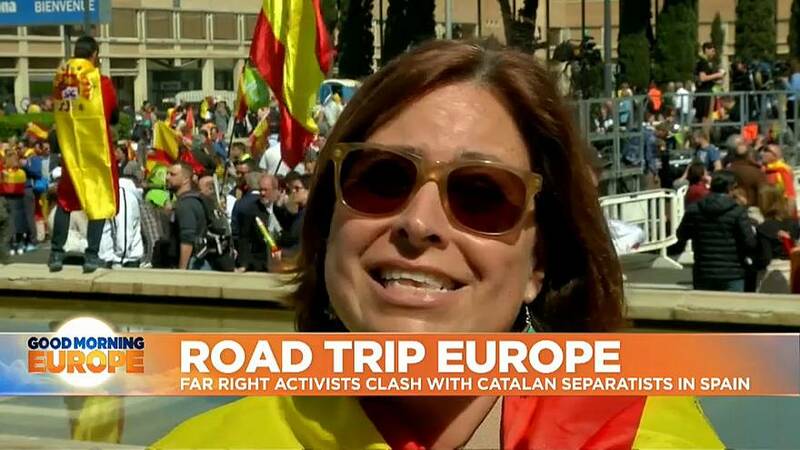 This week, our road trip team is continuing their journey through Spain, arriving in Barcelona, after talking Brexit with British nationals in Alicante. However, upon arriving in Barcelona, the team were met with a divided city. Spanish police estimated that around 5,000 Vox members demonstrated against Catalan independence, ahead of Spain's parliamentary elections next month. "I came for Spain, for my children, for my grandchildren and for all the Spaniards," one 75-year-old Vox supporter said. "They do not know what they are going to lose if we continue this situation. "I think Vox is the solution." Five people were injured and seven people were arrested after the protests turned violent, when Catalan demonstrators burned containers and threw stones at riot police.